I’m somewhat of a creature of habit, generally meaning that if I find something I like, I stick with it, I’m loyal like that. This extends to the mundane, the same Jasmine Green Tea, from the same guy at Peet’s on my way to the same 6am yoga class—with most of the same people, the same T-shirts, the RRL washed tees—best found eBay, and the original white Jack Purcell sneakers—undistressed—the way badminton player Purcell unboxed them, that I’ve been wearing since high school. Sure transient products have found there way into my rotation, flirtations with Starbucks, Hanes Beefy-T’s, and sneaker nuttiness when the Air Jordan thing blew up. All that to say, I’ve been around the block with wallets, from the traditional to the weird. Even slightly worn Trafalgar alligator wallets from Nordstroms would be happily and inexplicably exchanged by Nordstrom staff, so that was the chosen type for years. I’ve tried money clips—tough for receipts, and even a Gary Scott crazy titanium fold over wallet that still sees duty when on a surf trip and water/sand and wax are thrown into the mix. For the time being, I think I’ve found nirvana. 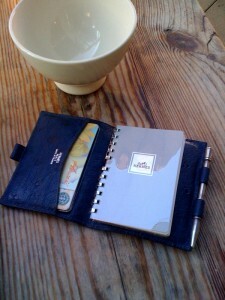 I’ve co-opted the Hermes GM Notepad/Agenda and made it my wallet. I think it’s a pretty great mix of size, form and function. The compact size has disciplined me on the number of cards I really need—there is a slot on each side—4 cards max each with receipts and cash on opposite sides. Most importantly, there’s a small unlined notepad and a small sterling pen that closes the wallet through the three loops. Not only do I need to be judicious in what goes in the wallet, I need to be thoughtful about what gets memorialized on the notepad. Always having a pen/paper in your pocket is super handy, and when others are rummaging through their briefcases/messenger bags or doing that weird chest patting—the international symbol for “looking for a pen”, I must admit I do feel superior. After several years, I now have a stack of the used notepads, which are great to return to for inspiration, or a phone number that didn’t make it into the iPhone. Hermes sales people around the world have a different opinion of the use of the notepad/agenda as a wallet, and I have been reprimanded in both Paris and Sydney for using what wasn’t designed as a wallet, as one. California stores in LA and SF are less concerned about this—mostly because the LA staff cant be bothered to help me with replacement pads and pen refills when Asian bag snobs are Kelly/Birkin fishing, and clearly on a mission—straight from LAX. It is true that the pads and pen refills are completely non-standard—not a big surprise, and require a trip to the local Hermes storefront. Sorry, the airline terminal outposts don’t carry either. I’ve converted a few forward thinkers to this traveling desk, and they seem happy. The upfront investment if you go the direct to Hermes route isn’t cheap, and there are often new and slightly used examples lurking on eBay, either mislisted or under Hermes agenda and/or notepad. The simple leather wallet itself should be under $300 at MSRP retail–think hal, with the pen slightly less. Pads come in bundles of two. The whole package wears quite well, I have more than a couple, including a dead stock 1972 model that came with that year’s unused calendar. Fair warning, you may be bidding against me for weird colorways and exotic leathers on eBay. 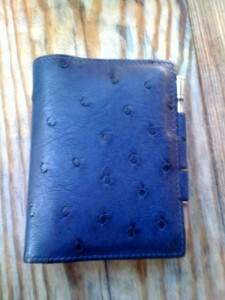 My current best friend is a beautiful navy ostrich, picked up at the irregularly occurring LA Hermes sale last week. Thanks so much for your site. I’m really enjoy perusing through your comments in general, but this posting on the agenda really hits home. A long time Hermes addict, I too have met with SA disapproval for using agendas as travel wallets. I have also been the unhappy witness to a poorly trained SA in hot pursuit of a Birkin sale in lieu of assisting me, despite the ostrich birkin hanging on my arm. I guess they figure I’ve already got mine, odds are I won’t be splurging any time soon. What is it worse is when my husband is with me and they fall over over him, assuming he paid for it. But I digress….When you purchase an item, you ought to be free to use it however you see fit without the raised eyebrows of an assistant in a store somewhere. Enjoy your agenda however you use it with pride and glee. I know I’m getting full use and enjoyment from mine… perhaps even a tad more with the knowledge that its chafing a little Hermes assistant somewhere. cheers.